France’s President Nicolas Sarkozy greets Syria’s President Bashar Al-Assad at the Elysee Palace in Paris November 13, 2009. [Landis analysis] France is getting ahead of the US and Israel in championing Syria and possible peace with Israel. Feltman says US differences with Syria are “profound.” This is the same language I have heard from the Syrians. They love the new demeanor of the Obama diplomats but doubt the “structural problems” between the US and Syria can be overcome. Why? It’s Israel stupid. Syrian support for Hizbullah and Hamas make it a terror loving state in the eyes of America. Syria, naturally, views its support for resistance to occupation as a fundamental right supported by international law. The number of conservative journalists who have taken the time out of their day to pen attacks on Syria has gone way down in general since the Obama administration started to improve relations with Syria. In the last week or so, however, a small but perceptible spike in articles employing anti-Syrian trash talking seems to have taken place. Lee Smith, Michael Totten, David Shenker and Barry Rubin have put their shoulders to the wheel this week. God bless them. The explanation? Possibly the right is worried that the US will make some sort of demarche toward the Syrians now that the Palestinian track is dead. Washington could heat up the Syrian track or at the very least give a push to Sarkozy’s diplomacy. This seems to be what Sarkozy and Assad are hoping for. Netanyahu has headed it off at the pass by blowing his “no preconditions” love kisses. In Syria’s lexicon, “No preconditions” means, “We aren’t giving you back any land.” Assad is not biting; he wants the Golan — all of it. I don’t think the conservatives have much to worry about. Netanyahu has outflanked Obama at every turn. US policy in the Middle East remains linked to Israel by golden handcuffs. Israel’s enemies are accepted as America’s enemies. This prevents the US from recalibrating its relations in the region. It is no longer preventing other Middle Eastern countries and emerging world powers from recalibrating their relations to countries like Syria and Iran. The result of Washington’s inability to ween itself from its constricting and destructive relationship with Israel, will be that the US increasingly isolates itself. More and more friends will defect from its interpretation of “security” in the region. Both Saudi Arabia and Egypt are complaining that they are becoming irrelevant. Turkey and Brazil announced warm relations with Iran in an effort to inoculate themselves from an impending US-Iranian crisis. India and China have already done so. They cannot afford to have their energy prices increased by further sanctions on Iran. The US is boxing itself in. “The United States is looking forward to cooperating with the new Lebanon government in a spirit of partnership in various fields after it obtains confidence,” Feltman said in an interview published Sunday by the daily An-Nahar. His remarks were translated into English by Naharnet. Feltman said he congratulated Prime Minister Saad Hariri on his new post and denied accusations by some Lebanese political leaders who charges that the U.S. administration had intervened in the government formation process. He accused Iran of continuing to export arms to Hizbullah and hoped that the Lebanese government would realize the “risk” of Israeli attacks in response to firing of rockets from Lebanon into the Jewish state. “But we are committed to achieve peace,” he said, adding that there was a “high degree of cooperation” between the U.S. and France on peace in the Middle East. 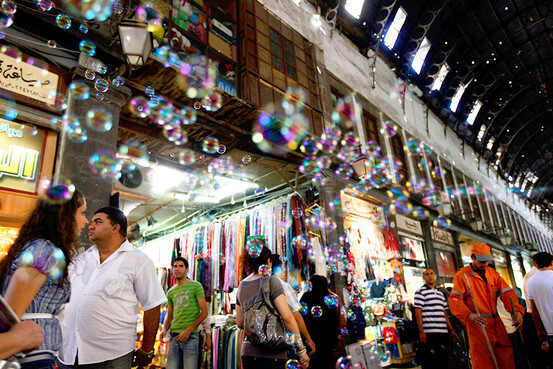 DAMASCUS, Syria — From the corridors of Syria’s stately central bank to the capital’s winding, barrel-vaulted souk in the heart of the Old City, it is hard to remember that 18 months ago Syria was a diplomatic and economic pariah state. Growth is expected to come in this year at a respectable 3%, despite a big knock from the global financial crisis. European tourists spill out of recently renovated boutique hotels in the capital’s Old City. American accents boom across the dining room of the Four Seasons. In the tony Maliki neighborhood nearby, tourists, foreign businessmen and fashionably dressed Damascenes sip $4 lattes at one of several bustling cafes. Central-bank chief Adib Mayaleh is practically giddy about Syria’s new allure to foreign investors. Amid warming ties between the West and Syria, executives from two French banks recently dropped by his office to talk about opening branches here. The same French bankers “previously said they would have nothing to do with me,” he says, gloating. In fact, Syria’s still-isolated economy protected it from the worst of the global financial crisis. Banks here haven’t been hit by defaults. Tourism receipts dipped but are recovering again. A recent private-sector-led investment boom in real estate shows no signs of the bust felt in other regional markets like Dubai. Earlier this year, real-estate adviser Cushman & Wakefield listed Damascus office space as the eighth most expensive in the world. That is behind Paris and two spots ahead of midtown Manhattan. “The only Syrians that can buy houses are those that can sell one first,” says real-estate agent Ayman al-Saman, from his closet-size agency in the center of town. Residential real-estate prices have tripled since 2004, he says. On top of all that, the West’s recent embrace of Syrian President Bashar Assad is translating into a booster shot of economic optimism. It has been a long road, with plenty of obstacles still ahead. When Mr. Assad took over here after his father’s death in 2000, he kept tight control of the state, suppressing dissent. But he also ushered in economic overhauls. Lower import tariffs allowed foreign goods from China and Europe to flow in. In 2003, banking reform opened the door to a handful of private lenders. The overhauls brought with them galloping inflation, but everyday Syrians embraced the new consumer culture. “We have lots of industry in Syria that produces everything we need, but people prefer things from abroad,” says 27-year-old shopkeeper Manhal Moujarid, in a packed appliance store full of Chinese-made heaters, tucked into the mountainside souk of Damascus’s poorer Muhajireen neighborhood. The sanctions didn’t directly affect much business here since American companies weren’t that active anyway. But U.S. Treasury officials suggested European firms risked being frozen out of the U.S. banking system if they didn’t play ball. “Foreign banks were intimidated by the American sanctions,” says Mr. Mayaleh, the central banker. Then, in what could be one of the most significant diplomatic rehabilitation acts in recent memory, Mr. Assad turned the tables. Last year, he agreed to indirect peace talks with Israel. He also helped to broker a deal between warring Lebanese politicians. Earlier this year, U.S. commanders traveled to Damascus to discuss Syria-Iraqi border security cooperation. French President Nicolas Sarkozy invited Mr. Assad to Paris in the summer of 2008 and flew to Damascus later that year. Mr. Assad traveled to France again on Friday. President Barack Obama made outreach to Syria a plank of his campaign. This summer, he promised to reinstate an ambassador and ease some economic restrictions. Washington has stopped short of offering to lift sanctions outright. And there has been little recent movement on naming an ambassador, triggering grumbling among Syrian officials. Still, the thaw has boosted confidence here, as shown by the sudden rush of Western bankers calling on Syrian officials. In an interview in his marble and wood office, Abdullah Dardari, Syria’s deputy prime minister for economic affairs, gestures to two business cards left on his coffee table by executives representing big U.S. financial firms. It has emerged that French President Nicolas Sarkozy had planned to bring together the leaders of Israel and Syria in Paris in an attempt to revive a peace process between the two countries which collapsed early this year, but his efforts failed when Syrian President Bashar Assad, who insists on Turkish mediation to return to peace talks with Israel, opposed the idea. The Syrian president was in Paris on Friday, two days after Israeli Prime Minister Benjamin Netanyahu visited the city and said he was ready to meet the Syrian president anywhere, at any time, without pre-established conditions, to re-launch talks over the Israeli-Syrian dimension of the broader Mideast peace process. Sarkozy, who apparently wanted to steal the show in the Middle East process, tried to arrange the two leaders’ visits to Paris at the same time. This way, even if he could not succeed in gathering Assad and Netanyahu together, he would be able to introduce their simultaneous presence in Paris as “France’s great role in peace efforts.” However, Assad said he would not land in Paris until Netanyahu’s plane departed the city, spoiling Sarkozy’s plans. “The Obama Administration remains attached to a delusional sanctions policy.”…. Moscow may well end up supporting another Security Council resolution expanding the existing sanctions regime against Iran—giving just enough to keep the United States from taking the issue out of the Council and forging a “coalition of the willing” or of the “like-minded”. Beyond its interest in keeping the Iranian nuclear file in the Security Council, Moscow is not happy with Tehran’s ambivalent reaction to a proposal that Russia helped to develop and advance, to refuel the Tehran Research Reactor using a significant portion of Iran’s current stockpile of low-enriched uranium. Conversations with Russian officials suggest that Moscow may also be looking for ways to show displeasure with alleged Iranian slowness in making payments for various weapons purchases and (perhaps) on the Bushehr nuclear reactor project. Furthermore, while Russia does not want to see a military confrontation between the United States (or Israel) and Iran, Moscow also does not want to see an overly rapid rapprochement between the United States (or Europe) and Iran. Among other considerations, Russian policymakers and the leadership of Gazprom are keen to prevent head-to-head competition between Russian and Iranian gas, especially in Europe. These considerations notwithstanding, it remains highly unlikely that Russia will support proposals from the United States and its European partners to go beyond exclusively proliferation-focused sanctions and target key sectors of Iran’s economy…. The fortnightly Middle East International has just been re-launched, under the stewardship of some very able editors and advisors. Some of you may recall the highly-regarded magazine during its first run from the early 1970’s up until 2005. Well, it’s back, and I have to say that it looks very good. Did a Syrian customs official assist the Mossad in the assassination of Hezbollah’s military commander Imad Mughniyeh ? A report published Saturday in Kuwaiti Alrai newspaper claims so. According to a western diplomat stationed in Damascus, the official received large sums of money to leave the border unsupervised, which allowed for the entrance of Israeli agents. Israel has denied any involvement in the Hezbollah operative’s assassination. According to the report, which cites the diplomat as a source, the Syrian intelligence opened an investigation after the February 2008 assassination which led them to former head of the customs authority in Syria, Hassan Makhlouf, who holds a rank similar to brigadier-general. The investigation focused on suspicions that Makhlouf received around one million dollars in exchange for opening the border crossings with Syria to smugglers for a number of hours at a time without supervising or overseeing activity at the site. According to the source, the Israeli Mossad was aware of this, and used it to get to Mughniyeh by infiltrating cells including Israeli agents of Iraqi descent. The agents reportedly carried Iraqi passports, spoke perfect Iraqi Arabic, and officially entered Syria a number of times during hours where only one clerk was stationed at the border. Did official know who he was assisting? The Syrian intelligence’s investigation focused mainly on whether Makhlouf gave the agents information on Mughniyeh or his movement from Lebanon to Syria and within Syria itself. According to the diplomat, after the assassination, Makhlouf directed most of his staff to only one border crossing – a move which some believe was meant to ease the flight of the assassins from the Syrian border. The report, which has not been confirmed by official sources, does not mention whether Makhlouf was aware of the fact that he was assisting Israel or doing so unknowingly. Makhlouf, who was terminated from his position following bribery charges, held hundreds of millions of Syrian pounds as well as dozens of houses and real estate plots in various locations around Syria. The diplomat said that in the times when Makhlouf left the border unsupervised, the agents carried out a number of activities in Syrian territory, including surveillance of the al-Kibar site near Deir ez-Zor where, according to foreign reports, Israel attacked a Syrian nuclear plant. 12/11/2009 One day after Hezbollah General Secretary Sayyed Hassan Nasrallah warned Israel not to try to launch any aggression against Lebanon, promising it with humiliating defeat; Israeli media revealed Thursday that Hezbollah knows every single detail about the activities of the Israeli occupation army. Israeli daily Yediot Aharonot said it has got a document confirming that Hezbollah knows every detail about the activities of the Israeli army and the command of the northern area and brigade 91 in the border area. The Israeli officer added that it dealt with information on the “binoculars monitoring, surveillance cameras, aerial alarm systems, land alarm systems, and an abundance of information about the drones, those aircrafts which we thought were working in complete secrecy.”…..
” …. Perhaps the most pressing concern for the Israeli command is that Hezbollah might have been able to infiltrate sensitive security services thus acquiring top secret documents and data. “Israeli experts and retired servicemen who served in the north have said that the data gathered by Hezbollah by means of the document was highly sensitive and that part of it had been cloned by Hezbollah from secret documents belonging to the 91st brigade. Hezbollah might have gathered the data by means of spies or by infiltrating into the Israeli side to take pictures,” Ronen Bergman, an Israeli expert in intelligence affairs told Israeli television Thursday…. “There is no doubt that Hezbollah knows the weapons used in every Jeep of every patrol. They even know the diameter of every mortar in the Jeep and the time of every patrol, including the documents that are usually sent from the division chief to the brigade chief. In fact they have information that cannot be seen through binoculars, so how did they get it?” an Israeli Channel 10 commentator asked. The former head of Israel’s National Security Giyora Eiland admitted – after Hezbollah Secretary General Sayyed Hasan Nasrallah’s speech on Wednesday – that Israel will undoubtedly fail in any coming war. He added that the outcome will not be different than that of the 2006 war ‘because Israel and Hezbollah’s capabilities have improved in parallel. Damascus — Syria has opened a new oil and gas processing station to help boost the country”s production capacity, local media reported Sunday. The Hayyan station opened Saturday near the city of Palmyra, some 200 kilometres north-east of Damascus. It has the capacity to process 600 barrels of oil per day and 650,000 cubic meters of gas. Oil Minister Sufyan al-Allawi said the cost of the project was about 450 million dollars, The German Press Agency “DPA” quoted the local media as saying. Another new station with a production capacity of 3.7 million cubic metres of natural gas is scheduled to open in 2011, officials said. DAMASCUS // Increasingly frustrated by US unwillingness to take a tougher line on Israel, Syria is looking to France for help in defusing regional tensions, politicians and analysts in Damascus say…. General Schwartz said it is “accurate” to describe the U.S. as concerned about Iran’s ability to strike with ground launched missiles. Iran test-fired on Sept. 28 its Shahab-3 missile, which has a range of 1,240 miles, far enough to hit Israel and Arab sheikdoms in the Persian Gulf that control vast oil reserves. General Schwartz’s comments come a day ahead of the Dubai Airshow where leading U.S. defense companies including Lockheed Martin Corp. (LMT), Boeing Co. (BA), Northrop Grumman Corp. (NOC) and Raytheon will market their latest weapons in the region. U.S.-based Raytheon Co., the world’s largest producer of guided weapons, signed last year a $3.3 billion Patriot missile defense contract with the United Arab Emirates, the region’s second-largest Arab defense spender. Nov. 17 (Bloomberg) — Following is a table ranking 180 countries according to the perceptions of the degree of corruption as seen by business people and country analysts. The only way the Obama Administration can achieve peace in the region is to help (not prevent) both Iran and Syria obtain few nukes of their own. Have you heard of Prof. Van Krefeld from Hebrew University in Jerusalem? He has a similar theory actually, that suggests the entire region would opt for peace only if everyone had nukes… But to be honest, I’m not sure anyone in the region would sleep well at night if that were the case. Of course I know what you’re referring to, when you suggest that Iran and Syria (Israel’s only real rivals) should have the real ability to threaten Israel. And maybe you’re right. That’s why I thought Syria should not have denied (or confirmed) the existence of a nuclear program in Syria. The two-state solution… is by now both universally accepted and close to dead. Near as I can tell, the “two-state solution” has been in effect already for about a decade, and certaintly since the wall was erected. So are the West Bank Settlers holding dual citizenship? Do they have voting rights in that 2nd-State, Palestine? Because if not, Israel should consider accusing Palestine of exercising Apartheid rule over their “state”. After all, “certainly since the wall was erected”! So are the West Bank Settlers holding dual citizenship? No, neither Israelis or Palestinians hold dual citizenship between these two countries. Do they have voting rights in that 2nd-State, Palestine? See above. This is why a defacto 2 state solution has already been a historic fact. Because if not, Israel should consider accusing Palestine of exercising Apartheid rule over their “state”. Considering the PA’s insistence on kicking every last Jew out of Palestine as well as not being able to guarantee their safety, it is no surprise. If you’re suggesting that every Jew in “Palestine” has a right to remain on the land where he grew up, where his ancestry lived hundreds and thousands of years ago, then I suppose you’d have to give the same right to others who also lived on this land, namely the Palestinians. I think some refer to this as “Right of Return”. Are you for or against the Palestinian Right of Return? Are you for or against the Palestinian Right of Return? After I answer your question with cogent reasoning, you continue to ask more questions. I don’t like to boast, but by changing the question, I feel as though I’m winning the argument. My original point is that there already is a 2-state solution. Period. The whole discussion about it is rather moot. To answer your new question, and simply put, I am for a negotiated settlement between the PA and the GOI. The “right of return” (Jews to Israel, Jews to Palestine, Palestinians to Israel, Palestinians to Israel) is something each country can negotiate or implement if they so choose. I’m for whatever they agree to. If I were part of the negotiations, I would agree that a right of return be granted to each people to their respective country: Jews to Israel and Palestinians to Palestine. Let me get this straight, are you saying:’I would agree that I can keep whatever I have stolen and you get to keep what I haven’t stolen yet’? intelligence briefing, and he’s then ready to shape the US policy..
president of the United States knows what Michael J Totten thinks. J Totten’s blog, and only then the president is ready to shape US policy. Is this an analysis? Aren’t we deserve better ? I don’t know if you are Israeli or Palestinian. I’m not. So I’m just suggesting that a negotiated settlement between the PA and the GOI is the best way forward. If you think “resistance” is preferable, that’s fine, just be prepared for the consequences. Israel disregards specific U.S. objection, approves plan to expand Jerusalem’s Gilo neighborhood. The Jerusalem municipal planning committee approved the construction plan Tuesday despite an expose in Israel’s Yedioth Aharonot newspaper earlier in the day revealing that the U.S. has specifically objected to the construction outlined in the plan. “The U.S. also objects to other Israeli practices in Jerusalem related to housing, including the continuing pattern of evictions and demolitions of Palestinian homes,” the statement continued. “Our position is clear: the status of Jerusalem is a permanent status issue that must be resolved through negotiations between the parties,” he added. The plan – named “Gilo’s western slopes” – will account for a significant expansion of the neighborhood. The planned 900 housing unites will be built in the form of 4-5 bedroom apartments, in an effort to lure relatively well-off residents. The plan was initiated by the Israel Land Administration, and has received an initial green light, but on Tuesday the authorization was finalized. The additional housing units are only part of the planned expansion of Gilo. In fact, the majority of apartments slated to be built in Jerusalem in the coming years will be located in Gilo. Other building plans in various stages of approval include some 4,000 new housing units in Gilo and adjacent areas. According to sources in the planning committee, extensive building plans stem from the scrapping of the Safdie plan, which would have seen the city expand westward. The Safdie plan, named after architect Moshe Safdie, included over 20,000 housing units on open areas covering 26,600 dunams (some 6,600 acres) west of the city on natural and planted forests near Ramot. The plan had come under attack by environmental groups, and was later discarded. According to the sources, this created a need for new land for construction, which can be found in the southern parts of the city and beyond the Green Line. Senior Palestinian official Saeb Erekat said Tuesday that there was no point in negotiating while Israel expands Jewish neighborhoods in the part of Jerusalem the Palestinians want for their capital. He said the Israeli move shows that it is meaningless to resume negotiations. Over recent days, American officials have shown a tremendous amount of interest in the construction plans, and have even approached left-wing activists for information. رحّلت السلطات المصرية مراسلا صحفيا إسرائيلي الجنسية جاء للقاهرة لتغطية مباراة مصر والجزائر، وتبنى موقفاً مناصراً للجزائر بعد أن لف نفسه بالعلم الجزائري حتى يسهل له تشجيع الجزائريين على الدخول فى مواجهات مع المشجعين المصريين لعرضها فى القنوات التلفزيونية الإسرائيلية. وأبرزت وسائل الإعلام المصرية قرار الترحيل مستدلة به على أن طرفا ثالثا (مشيرة إلى إسرائيل)، يقوم بإشعال الفتنة بين مصر والجزائر مستغلة الأحداث الكروية الأخيرة، وأنها تروج لذلك بواسطة مواقع الانترنت عبر خاصية التعليقات والاختفاء وراء أسماء مصرية وجزائرية. وفي اتصال بثته قناة “نايل سبورت” الحكومية المصرية فجر اليوم الأربعاء 18-11-2009 في برنامج “دائرة الضوء” الذي يقدمه الصحافي الرياضي ابراهيم حجازي، تحدث رئيس الشؤون الإسرائيلية في صحيفة “المصري اليوم” المستقلة محمد عبود، مشيرا إلى أن المراسل ينتمي إلى فلسطين 48 ويحمل الجنسية الإسرائيلية، وربما يكون وراء إرسال صور مفبركة إلى بعض الصحف والمواقع الجزائرية توحي بوجود قتلى بين مناصري المنتخب الأخضر في مباراة السبت الماضي، وهي الصور التي تسببت في وقوع أحداث انتقامية ضد بعض مقار الشركات المصرية العاملة في الجزائر وبعض أفراد جاليتها، وإلى عودة بعض المصريين إلى القاهرة خوفا من أعمال أكثر عنفا ضدهم. وقال إبراهيم حجازي أن هذا يكشف بما تدبره اسرائيل ضد الشعبين الشقيقين “ونحن غافلون عن ذلك أو منومون في الانشغال بنتيجة مباراة لا تعني الشئ الكثير وسيتوقف الحديث عنها بعد يوم أو يومين فيما تبقى الأحقاد والفتنة التي يتم زرعها فينا”. وعكست وسائل الاعلام المصرية الاهتمام الاسرائيلي المحموم بتغطية أجواء المباراة المصيرية بين منتخبى مصر والجزائر فى إطار التصفيات المؤهلة لكأس العالم ٢٠١٠ بجنوب أفريقيا. وأشارت إلى إن الصحف الإسرائيلية الكبرى شنت الثلاثاء 17-11-2009 هجوماً عنيفاً ضد السلطات المصرية التى أوقفت المراسل «حسين العبرة» الذى يعمل لصالح عدد من الصحف الإسرائيلية الناطقة بالعبرية، ولصالح صحيفة «بانوراما» الناطقة بالعربية أيضاً. وقال حسين العبرة فى تصريحات خاصة لـ”يديعوت أحرونوت”: “شعرت بنفس مشاعر عزام عزام لحظة وصولى لإسرائيل عبر منفذ طابا، ونجاتى من الاعتقال والتحقيقات التى استمرت يوماً كاملاً فى مصر”. وحكى الصحفى الإسرائيلى أنه وصل إلى مصر، الخميس الماضى، لتغطية أجواء المباراة المصيرية بين منتخبى مصر والجزائر فى التصفيات المؤهلة لكأس العالم، وكان يعد رسائل إخبارية من القاهرة لصالح الإذاعة الإسرائيلية. تقارير الصحفى الإسرائيلى، حسين العبرة، على موقع «بانيت» جاءت تحريضية ضد مصر، ونشر صوراً حميمية تجمعه بالجماهير الجزائرية، وصوراً أخرى توثق تحركاته فى القاهرة، ملفوفاً بالعلم الجزائرى. ويقول العبرة لـ”يديعوت أحرونوت”: إن السلطات المصرية أوقفته عندما حاول تصوير بعض المشاحنات التى وقعت بين جماهير الفريقين أمام مدخل الفندق الذى يقيم فيه، واصطحبته أجهزة الأمن المصرية لتحقيقات مطولة استمرت من مساء السبت عقب انتهاء المباراة، وحتى عصر الأحد. What can you do with a yearly budget of $600K for water projects? I can’t come with any idea, could you please help me figure that out? JL said: “Syria does not need the US to lift its sanctions, which congress will not do so long as Syria objects to Israel occupying its land.” I thought Congress justified sanctions against Syria because of Syria’s role in Lebanon and support for Hamas and Hizballah. I have never heard any one justify sanctions simply because Syria wants the Golan Heights back. Sanctions help authoritarian regimes to survive — See, e.g., Communist China, Communist N. Korea, Castro’s Cuba, Khaddafi’s Libya, Saddam’s Iraq. Sanctions result in less wealth and resources in a state, which allows the governing regime greater control over the disbursement of the limited wealth and resources to its patrons (the supporters of the regime). Everyone else must fend for themselves. The Baath regime does not need sanctions to be lifted. Or any other external pressure to be lifted. That pressure is the only thing keeping the Baath Party alive. If Syria was not being pressured externally, the Baath Party would collapse under its own weight. Dear S. Moses, Clearly we don’t agree. Syria’s strategy to get back the Golan is to support Hizbullah and Hamas. It cannot hope to compete militarily with Israel. Syria’s Nuke efforts, such as they were, were recently bombed by Israel, as I am sure you are aware. Support for resistance is Syria’s Golan strategy, as you are doubtlessly aware as well. As for the Syrian government and state collapsing if sanctions were lifted, this is bunkum. The Baath party did fine before sanctions were placed on Syria and will do fine after they are lifted. Have any of the other authoritarian states in the Middle East collapse because they are not sanctioned? No. The Syrian state’s legitimacy and longevity is not based on Israel or sanctions. I have heard this type of argument repeated many times, but never understand where it comes from or on what it is based. It strikes me a pure propaganda. If it were true, every opposition member and Israeli would be asking to lift sanctions on Syria in order to destroy the state. They ask for more sanctions – witness WINEP as example A. Are you suggesting that Israel is Assad’s greatest fan? The Syrian state’s legitimacy and longevity is not based on Israel or sanctions. I’m in suspense. Aren’t you going to give us a clue? Robert Satloff and Emile Hokayem are still very concerned that scores of foreign fighters are infiltrating the Iraqi border and are the main reason why there is no stability in Iraq 6 years after the United States’s army started to manage that country… and therefore they believe that the United States should not respond positively to Syrian tactics or tricks. Washington sees little progress on issues that matter most for US interests, and it worries about European and Arab over-eagerness. Indeed, the real success for Mr Assad is that western and Arab overtures have come at no price. The alliance with Iran shows no sign of loosening, weapons continue to flow into Lebanon in contravention of UN resolutions, the tough rejectionist language contradicts Syria’s claims to be seeking peace (Mr Assad still describes muqawama, resistance, as Syria’s strategic choice) and the progress on border security with Iraq remains timid; Syria’s contribution to Iraqi security might have more validity if it intercepted foreign insurgents at Damascus airport, rather than allow them to cross the border at will. Mr Assad has undeniably shown political acumen by betting that time, fatigue and shifting Palestinian and Lebanese politics would erode international will, and he could manoeuvre his way out of isolation at little cost. He has avoided the hard choices about Syria’s orientation and behaviour, but they have not vanished. And time will not always be on Syria’s side. But out here, near the northern end of that border, there is little evidence of any activity to support such accusations. Officers at Iraqi Border Fort 24 – one of a chain of police fortresses floating in the haze along the desert frontier – could not speak on the record. But they told us that in the past eight or nine months, the Iraqi Border Guard in this area have not intercepted a single armed militant. They are currently holding 33 detained infiltrators, all of whom are believed to be cigarette smugglers, who would normally carry one Kalashnikov assault rifle per group for self-defence. We spent two days monitoring the nearby border area with a ground patrol from the US Cavalry. “During our time here so far, the past 21 days, we’ve caught three border crossers, and there’s a very good likelihood that they were just normal people trying to smuggle cigarettes across the border to pay for their families,” said squadron commander 1st Lt Nicholas Grodevant. This sums up the problem between Syria and the EU , apparently the EU is looking for markets , more than low wage labor. Iran’s PressTV says it has caught Israel forging documents in an attempt to implicate Iran in arms smuggling. The Israelis have been maintaining that a ship, the Francop, that their forces boarded near Cyprus originated in Iran and was bringing arms to Hizbullah and Hamas. Many US news outlets published the accompanying picture, which seemed to indicate that the arms were being supplied by the Ministry of the Sipah [i.e. of soldier]. It is tempting to speculate as to how the Israelis got the letterhead of the Iranian Ministry of the Soldier. It should be remembered that in the 1980s, Israel was allied with Khomeini and received petroleum and other goods from Iran in return for helping against Iraq. It is likely during that era of good feeling that Israel received the letterhead, and whoever dredged it back up to plaster on the goods carried by the intercepted ship did not realize that in the meantime the Iranians had changed the name of the ministry concerned. The Likud government is perfectly capable of such a diversionary tactic. Maybe it has a good explanation for all this. We’d like to hear it. For “cont’d” postings, click here. Let’s buy a vacation house in occupied Palestine! Another slap on the face of Obama. “Dov Hikind, a member of New York state’s assembly, looked out over Jerusalem’s Old City and dismissed the “extreme” view on the matter taken by his party’s president. He urged fellow American Jews to buy homes on occupied land rather than in traditional U.S. vacation spots. “I’m trying to get a whole bunch of my friends to actually buy,” said Hikind during a tour of settlement housing projects for several dozen potential U.S. investors. You don’t really buy that, do you? Where did all those weapons originate? Was it some ordinary arms shipment from New Zealand to Italy? And why is Syria insisting there were no weapons on that ship? Anyone can pick up the phone and call the company, or even the crew, and ask them. This silly attempt to hide the truth is an insult to the intelligence of many. It would be equivalent to Israel denying it had sent its planes to bomb that installation in Deir Ez-Zur two years ago. Sectarianism and discrimination against the women are still abundant in this code. Please refuse any code that is based on a sectarian law that treats Syrians based on their sects rather than their equality under citizenship. Syrians need a secular civil law that treats all citizens, men and women, equally. Don’t let this law pass as it will take us back to the dark ages. PS: Dr. Landis, Alex, etc, please post an article on this issue on the main blog as I believe this is a very serious issue that could control the fate of millions of Syrians. Thanks for your efforts. MOUNTAIN VIEW, Calif. (November 9, 2009) – Google Inc. (NASDAQ: GOOG) today announced that it has signed a definitive agreement to acquire AdMob, a mobile display ad technology provider, for $750 million in stock. This acquisition will enhance Google’s existing expertise and technology in mobile advertising, while also giving advertisers and publishers more choice in this growing new area. “Attracting the world’s top engineering talent and people with entrepreneurial vision to Google has always been crucial to our success. AdMob’s proven track record in innovating at speed will help maintain that culture – which is why we are so excited to be working with them,” added Vic Gundotra, Vice President of Engineering at Google. Both companies have approved the transaction, which is subject to customary closing conditions. Sanctions weren’t invented with Syria in mind. They are imposed by the U.S. almost reflexively when faced with countries who won’t tow the line. My point is only that sanctions only tend to isolate a country, not harm the regime in power. It’s not propaganda, at least not that I am aware of. It’s just an observation. There are plenty of examples to choose from. As for the Baath Party comments, I think the isolation of Syria and belligerence of the U.S. in Iraq has breathed new life into a party that would have had much greater pressures at home to reform in the last decade. Syria today is remarkably more liberal than the Syria I experienced when I first visited there in 1993. Why was the lid go back on the genie’s bottle? As for whether the U.S. thinks it would benefit from the Baath Party collapsing, see last election in Gaza. Norman — Waivers are made on an individual basis, by the President. I believe he has issued an executive order authorizing waivers. I have not applied for one yet. But I might soon. If me-too neo-con a la francaise Sarkozy is going off the reservation hot on the heels of the intrepid Erdogan, well, then, as you implied, the reservation would seem to be shrinking rather fast! Does anyone else think that wet-noodle protestations of “dismay” over Netanyahu’s little games by the world’s last remaining superpower are beginning to demean that superpower’s power? How much of a big power’s power is real stuff and how much is perception? When a tiny tail starts wagging the dog this obviously; when a big, tough regime starts sounding like an upset but meek and polite teenage girl…exactly what does “power” mean? If my humor seems forced, well, it is; I am trying not to cry. I don’t know what is happening in Syria but things are going downhill and in full speed. There is a terrible hidden unrest on all layers starting form religious, intellectual, and social that need serious solutions or at least a national debate to clear things up with this dangerous government, and I don’t think that we have enough time to undo the damage already done. – Twisted Islamic rules are taking over Syria multi-cultural and multi-religious reality without any reaction as if things are usual or if we already lost the battle of secularism for the religious gang. – Writers and free voices are getting shut and even put in jail without a reason and 10th of names being added to the black list of the Syrian government daily with no explanation, while the bad guys are in the street running their religious schools and spreading hatred into our society are letting free to do it with the support of the government itself! – Saudi women rights are getting better while the Syrian women’s are in decline and we are killing our women everyday 100 of times with our ‘manly’ back warded rules and traditions! – The gap between the rich and the poor is deepening and we start to see homeless people in the street of Damascus and Aleppo as a normal scene of our cities! – Social dysfunction and unprecedented numbers of sexual assaults on women and children. Crimes on the rise with no strong justice system to prevent it or at least to trial the criminals and make them pay the price to the society; let those crimes be against human or the nature. All that and much more makes me wonder about the future of my country and what is the vision this Syrian government has for us and how are they running the country or more precisely WHO is running the country and why they are pushing it further in the dead zone? Why, how and when did Syria become like this, closer to a banana republic than a true republic? Does anybody have any answer or a rational explanation of this dreadful situation? It’s so depressing. Ynet reports that Assad is making a guarantee for withdrawal from the Golan precondition to peace talks with Israel. If this is true, there will be no peace talks during Netanyahu’s term in office. After Hillary and Obama’s fiasco on the subject of the settlements and the disarray the US administration seems to me about the elusive negotiations, it is probable that Bashar did not want to sound mellow and he took a stand as hard as Netanyahu. In summary he may believes that as long as there is no serious commitment from Israel for steps to peace and no US real pressures to reach that stage (the news Jerusalem settlements point to the negative), it is a waste of time to offer any compromise. How long do you think Netanyahu will stay on power? What events or situation may make him leave? But who’s next? I don’t know what power Israel has with Syria, but I do know what Syria can do that it hasn’t, with Israel. And that is talk to us, to the average Israeli. I’ve suggested before allowing Israeli journalists to enter Syria, to interview people on the street, and of course the leadership. Public opinion in Israel still counts, and it can be changed. One day 94% of it supports the Gaza operation, and less than a year later 58% support talking to Hamas. As to your question: Netanyahu seems extremely stable right now, enjoying perhaps the strongest right-wing controlled Knesset than ever before. Nothing seems to be threatening him at the moment. He doesn’t depend on Kadima, and he’ll be able to survive even a split in Labor, should that ever occur. I can’t even imagine war causing him to be replaced. If tremendous U.S. pressure is placed on Israel, sanctions from Europe, etc., I imagine Bibi will budge long before he leaves office. As for who’s next, that’s an excellent question. There is no one next. Tzipi Livni failed to become PM twice! First time, it was given to her on a silver platter (without elections), and she failed to create a coalition. Second time, Bibi offered her to share the PM’ship, and she refused. She’s no leader, and I suspect she will never be PM. Barak won’t either. He’s ruined his own party (in Rabin’s days Labor had 40 seats. Today, recent polls give it 6! ), and his popularity is dropping. Syria should understand this. There is no replacement for Bibi right now. He’s our “best man”. This is what you have to work with. After Hillary and Obama’s fiasco on the subject of the settlements and the disarray the US administration seems to me about the elusive negotiations, it is probable that Bashar did not want to sound mellow and he took a stand as hard as Netanyahu. The fact of the matter is that Arafat negotiated with the US and Israel without a halt to building within established settlements. That the Palestinians and PA now do not want to negotiate with Israel, is a change in the Palestinian’s foreign policy, not Israel’s. Similarly, Assad and GOI have negotiated in the past, face-to-face. The lack of movement on this track does not translate to a change in Israel’s negotiating posture. Israel has never promised anything prior to a signed agreement, as it should be. The typical finger-pointing at US administration is already boring. The Palestinians and the Syrians always find fault with American and Israeli leaders e.g. (“After Hillary and Obama’s fiasco…”), and never the Arab governments involved. At some point one has to wonder if how important a permanent solution is to these governments. I reached my conclusion years ago. With the 60 years of distrust and failed promises between the Arabs, Israeld the international community you cannot expect anything to happen unless there is serious long term commitment from the international community to allow negotiations to succeed, not only start. The US seems to err after the era of Bush that made the distrust between the arabs and the international community even bigger. Obama has a long way to go, does he have the time? The US seems to err after the era of Bush that made the distrust between the arabs and the international community even bigger. Your comment is exactly my point. There is no way possible to increase Arab “distrust”, “anger”, “frustration”, whatever you want to call it. With each subsequent US president, starting from President Nixon, Arab anger keeps getting “bigger”. If it got any larger, every Arab’s head would pop like in the movie “Mars Attacks”. So, no matter who is president, including liberals and leftists like Clinton and Obama, or Barack and Livni, I think we can say Arab anger has already “maxed-out”, reached its limit and can’t get much worse. I supppose we’ll have to wait until the US or Israel picks an al-Queda supporter for president/Prime Minister. Interesting piece published today by Michael Rubin on Syria and its support for Islamist terror. On February 14, 2005, a huge bomb killed former Lebanese prime minister Rafik Hariri as his motorcade drove through Beirut. All eyes fell on Damascus. Syria’s leaders had motive: Hariri was a prominent Lebanese nationalist who opposed their attempts to grant Lebanon’s pro-Syrian president Émile Lahoud an unconstitutional third term. The Syrians had the means to carry out such an attack: Their army had occupied Lebanon for more than fifteen years. Syrian military intelligence (Shu‘bat al-Mukhabarat al-‘Askariya) operated freely throughout the tiny republic and maintained operational networks there. Asad had actually threatened Hariri: Druze leader Walid Jumblatt reported that at a meeting with Asad and Hariri a few months before the latter’s murder, Asad told him, “Lahoud is me … If you and [French president Jacques] Chirac want me out of Lebanon, I will break Lebanon,” a remark Jumblatt interpreted as a death threat to Hariri. Following the assassination, Syria became an international pariah. U.N. secretary-general Kofi Annan dispatched a fact-finding mission. This mission resulted in the establishment of an international, independent investigating commission headed initially by German judge Detlev Mehlis. U.S. president George W. Bush and French president Jacques Chirac, two leaders whose views of the Middle East seldom coincided, agreed to isolate Syria diplomatically. The State Department withdrew its ambassador, Margaret Scobey, and maintained only a lower-level diplomatic presence in Damascus. Under immense pressure, the Syrian army finally withdrew from Lebanon. But, over subsequent months and years, as Asad detected chinks in the West’s diplomatic solidarity–and as U.S. members of Congress began to defy the White House and re-engage with Asad–the Syrian regime began to put cooperation with the U.N. investigators on the back burner. Today, Syrian cooperation with the Special Tribunal for Lebanon, the successor to the more ambitious Investigation Commission, is negligible. While many in Washington and other capitals continue to perceive Syria as a largely secular state with a leadership fundamentally hostile to radical Islam, today’s Syrian leadership encourages both radical Islam and international Al-Qaeda. Two common assumptions handicap an understanding of terrorist networks. The first is that Shi‘i and Sunni groups or governments do not cooperate. Hence, some scholars argue that it is impossible that the Iranian regime could supply arms to the Taliban. In 2007, Juan Cole, a professor at the University of Michigan, wrote, “Among the more fantastic charges that Bush made against Iran was that its government was actively arming and helping the Taliban in southern Afghanistan. In fact, the Taliban are extremist Sunnis who hate and have killed large numbers of Shiites. Shiite Iran is unlikely to support them.” The evidence that they have done so, however, is overwhelming as U.S. forces have seized truckloads of Iranian weaponry en route to the Taliban. Another false argument–and one that applies specifically to Syria–is that secular regimes do not support radical Islamist groups. The Egyptian government, for example, has long turned a blind eye to the supply of Hamas terrorists through tunnels from Egyptian territory. Libya, too, has engaged in the practice, supporting the Islamist terrorist group Abu Sayyaf in the Philippines even as Libyan leader Mu‘ammar al-Qadhafi sought to present himself to the West as an ally in the fight against radical Islam. To ensure U.S. national security, U.S. analysis must be based on reality rather than image. Despite Asad’s stated animosity toward Islamist terrorism and his regime’s trumpeting of its own vulnerability to radical Islamism, the Syrian record shows a willingness not only to tolerate but also to aid Islamist groups and assist Al-Qaeda violence. Such hatred is real, but in the Middle East alliances shift and enmity can be deferred. Enemies cooperate against those whom they consider a mutual threat. Iran and the Taliban–who hardly like each other and were on the verge of military conflict in 1998–nevertheless found themselves allied only a decade later in efforts to undermine U.S. stability efforts in Afghanistan. For all his diplomatic promises about non-cooperation with terrorists, the evidence that Bashir al-Asad aids and abets Al-Qaeda is damning. In September 2007, U.S. forces in the northern Iraqi town of Sinjar, twelve miles from the Syrian border, discovered computers and a cache of documents that included the records of more than 600 foreign fighters who had infiltrated into Iraq between spring 2006 and summer 2007. The documents show a pattern of Syrian behavior at odds with the regime’s public statements and diplomatic posture. While the records listed Syrian as the nationality of only forty-four of the foreign fighters–behind Saudis (237) and Libyans (111)–Syrians coordinated the insertion into Iraq of almost all the fighters listed. The insertion of the Saudi terrorists is especially instructive as Saudi Arabia shares a lengthy and porous border with Iraq. The Saudi jihadists presumably choose to travel to Iraq through Syria because Asad tolerates what the Saudi leadership will not. It is also possible that the total Syrian numbers are underrepresented since Syrians formed a majority of the detainees held at Camp Bucca, the main U.S. detention camp in Iraq. Underlining the extent and intensity of these recruitment efforts was the fact that almost two-thirds of the Syrian nationals who volunteered for jihad in Iraq–and all those who reported initial recruitment by the Internet–became suicide bombers. The recruitment of suicide terrorists is complex. It requires psychological screening and indoctrination. If the Syrian government claims to be unaware of such activities in its own towns, cities, and mosques, then Syria’s future stability cannot be assumed. It is far more likely that the Syrian regime chose to turn a blind eye to terrorist recruitment on its soil. Again, however, this Syrian blind eye should raise concerns about the country’s future stability as it suggests a vulnerability to blowback should these same Islamist terrorists decide to return to Syria to take on the Asad regime. The Syrian government’s denials of facilitation for Islamist terror are less credible given the country’s role as a transit point for radical fighters and arms. Almost all Saudis, Libyans, Egyptians, Algerians, Kuwaitis, Yemenis, and Moroccans transited Syria to reach Iraq. Syria is a police state. It is implausible that its government is unaware of the transit of large numbers of foreign nationals, some through Damascus International Airport, others across the border from Jordan and Turkey. Nor can the Syrian government simply blame spontaneous outrage at U.S. occupation of Iraq: Many of the foreign fighters who traversed Syria–and more than one-fifth of the Syrians represented in the Sinjar records–made cash contributions to Al-Qaeda in Iraq, often more than $1,000 and, in some cases, more than $10,000. For an outraged jihadist to take a weapon and try to cross the border is one thing; to acquire information necessary to donate to Al-Qaeda and actually transfer the money takes more direction. There is a growing discrepancy between the image the Syrian regime seeks to convey–that it cooperates in the war on terrorism by cracking down on radical Islamists–and the reality, which is that senior Syrian officials coddle and protect radical Islamists and Al-Qaeda operatives. Ironically, reports from international organizations such as Amnesty International have provided the Syrian regime with unwitting international legitimacy by endorsing its claim to intolerance for radical Islamists. Amnesty criticized the regime for the arrest of twelve and for the incommunicado detention of ten alleged Islamists in Dayr az-Zawr and also complained about the imprisonment of an Islamist returned to Syria in a “suspected unlawful rendition to Syria by the U.S. authorities.” Such criticisms may be true, but without a proper context, they suggest that the regime exhibits complete hostility to Islamism. After Hafiz al-Asad reasserted his authority, the Syrian government quietly began to use religion to co-opt those who might otherwise be attracted to the Muslim Brotherhood and its message. The Syrian regime financed mosques, subsidized clerics, and broadcast more religious programming on the tightly-controlled state television. Just as Saddam Hussein–once embraced in Western capitals for his staunch secularism and hostility to political Islam–found religion after his 1991 defeat in Operation Desert Storm, so, too, has the Asad regime cynically turned toward religion even as, like Saddam’s regime, it seeks to maintain its image of hostility to radical Islam. Indeed, this appears to be a possibility to which Al-Qaeda theoreticians are not blind. Among the documents found in the Sinjar cache was a lengthy and detailed tract examining the lessons learned from the Syrian Muslim Brotherhood’s violent campaign in Syria. It found that the brotherhood lacked a comprehensive plan, was fractured into too many groups, failed to indoctrinate sufficiently, had weak public relations, and was too dependent on outsiders for resources. Al-Qaeda blamed the failure of jihad in Syria up to Hama on failed Muslim Brotherhood leadership but found that “most of the base members, some of the mid level leaders, and maybe a few high level leaders are innocent and decent people . . . Those faithful were driven to the jihad with true resolve; they willed their leaders to act. Unfortunately all their efforts went in vain despite . . . the abundance of possibilities, and they set an example for ‘Jihad Quality’ by working diligently, persistently and silently, and by avoiding in-house and partisan bickering.” Al-Qaeda’s analysts found the ground in Syria still fertile for jihad should Al-Qaeda spark a movement that had learned the lessons of the past. Michael Rubin belongs to the pro-israel American Enterprise Institute, famous home of Paul Wolfowitz, Richard Perle, John Bolto and other neo-cons who feel a little voiceless after the arrival of Obama. It says it all. do you think that he is lying? It is far easier to dismiss someone by saying “he can be grouped with those people over there so we don’t have to listen to what he says” than it is to actually refute the arguments of a person who holds a phd in history from Princeton. The logic is this: he works for AEI, I don’t like some of what a few people at AEI have written, so I shouldn’t consider what someone else says because they also work at AEI. That requires a lot less energy than reading and then discussing the merits and veracity of what Michael Rubin wrote. The truth sometimes hurts. His article is nothing new. Syria has always played both sides of the fence. They are deeply involved in terrorism, and that is why the Obama administration is treading carefully. I’m actually surprised. I would have thought Obama would have copied the Bush-Baker and Clinton-Christopher administration tact, and “turn the other cheek”. I think everything is on hold until there is some sort of “breakthrough” with Iran. Since Syria is putting most of her eggs in the Iranian basket, I think it’s fair to say nothing will move until Iran’s nuclear ambitions are neutralized. I can’t accuse him of lying , he is too intelligent to do that. I think he is distorting the events as most of the AEI intellectual have done when they analyze anything ( From Iraq nuclear weapons to Iran nuclear weapons). I have seen too much of them on TV and in the news to take anything they say as the objective truth. I am sure all their articles, so overstretched and so professionaly documented to be convincing, can be argumented one by one, but what a waste of time! I have seen too many times how smart and manipulative these AEI guys (Wolfowitz, Perle) can be. Not only I dismiss anything they write or say, but it sometimes convince me of the opposite! Now if you like to believe what they say, go ahead! They always need more neo-cons sympatizers. I found this article about a possible solution between the Palestinians and Israelis. This AEI fellow, like all of his kin, has a pre-packaged article that he did not even bother researching. Just look at the name he gives the Syrian president (Bashir). To me that is not an innocent mistake, it only signifies the casual attitude towards truth these semi-intellectuals take to serious issues. What a con job these guys are. The article is rehashed cut and paste half truths, but packaged to be no more than whatever comes out from AEI, Garbage. Nothing more, nothing less. The only exception is that this garbage has a lot of toxic, right wing Israel first background. It hurt the ME, and it is hurting the US as well. So far by more than a Trillion dollars, and a few thousand lives. Yes, it sounds very fair and reasonable to me. What do you think? I wonder if the rotten politicians in both side can spell it as clearly. Six-Day War, ministers, including Menachem Begin, were willing to give up on the gains made on the Syrian front in exchange for peace. listing the following conditions: “A peace agreement would require: 1. Thus were created, 42 years ago, the basic conditions for an agreement, which are still valid today. discuss is the security of Israel under such circumstances. Kinneret and the sources of the Jordan River), in order to ensure security would be sufficient. security, but these will be minor and will stem from the two basic conditions. At the Israel Defense Forces headquarters there is general consensus that the benefit of a peace accord with Syria outweighs the risk of pulling out of the Golan Heights. The IDF brass is convinced that it is possible to reach arrangements that will not undermine the country’s security. attack. Actually, a pullback from the Golan Heights will improve deterrence. A demilitarized zone, free of offensive forces, will distance the armies of the two states further and would create a buffer where, if Syrian forces enter they will be immediately discovered, and guarantee a deterrent against the possibility of war. If early warning stations on Mount Hermon are added to the equation, it will be possible to detect a concentration of forces and expose violations of the demilitarization agreement. The next war with Syria, if it occurs, will be characterized less by armor battles and conquest of territory, and more by missile and rocket launches from behind the front lines. The Syrian army has about 1,000 ballistic missiles, with a range of 300-700 kilometers, covering every point inside Israel. More problematic, from Israel’s point of view is Syria’s rocket arsenal. The IDF does not really have a response for the thousands of 220 mm rockets (with a range of up to 70 kilometers) and the 302 mm ones (with a range of 90 kilometers), like it had no response for the thousands of Katyusha rockets launched by Hezbollah in 2006. Moreover, the Syrian army has deployed tens of thousands of BM-21 rockets, whose range is 20 kilometers. The Golan Heights does not contribute a thing in countering the missile and rocket threat. security. The Syrians seemingly agreed in talks at Shepherdstown in 2000 to the deployment of U.S. or European forces, as a force in the demilitarized buffer zone. Prime Minister Benjamin Netanyahu must decide whether achieving peace with Syria is a strategic target, as the chief of staff and defense minister think. If he decides yes, then the argument that has been made more than once to excuse delaying an agreement with the Syrians, that the cost is too high because it may undermine Israel’s security, is patently invalid. Syrian President Bashar Assad appears to have made the strategic decision to sign a peace accord with Israel. If there are those who think that this is mere posturing, this is the time to test him. The security of Israel will not be endangered if it turns out that Assad does indeed mean what he says. Turkish Prime Minister Recep Tayyip Erdogan’s harsh criticism of Israel for its policy in the territories in general and in Operation Cast Lead in particular unjustly changed Turkey’s status from that of a close friend to that of an almost-enemy. Israel attributed Erdogan’s criticism to the pan-Islamic slant of Turkey’s ruling party, the country’s growing ties with Iran and the aim of Turkey and Syria to replace their Western allies with Arab ones. In a single moment we forgot the fact that it was Turkey that managed to renew the dialogue – albeit indirect – between Syria and Israel; that despite its extensive commercial ties with Iran, this Muslim state has no intention of damaging its own relations with Israel; and that ties with the West – including Israel – are part of Turkey’s strategic concept. The Turkish criticism is no different in essence from that being heard in some European countries or on American campuses. If it is sharper, that is partly because of the personal insult felt by Erdogan, who a few days before Operation Cast Lead hosted then-prime minister Ehud Olmert and even conducted an indirect phone conversation between Olmert and Syrian President Bashar Assad. Erdogan’s request to attempt to mediate between Israel and Hamas was rejected; instead, the Turkish premier was forced to deal with the fallout from a violent operation in Gaza. Industry, Trade and Labor Minister Benjamin Ben-Eliezer is trying to put an end to the public account-keeping between Israel and Turkey. He proposes that Turkey resume its mediation between Israel and Syria. This is an appropriate proposal, one that testifies to a realistic approach that aspires to put aside the criticism, out of an understanding that peevish anger cannot be the basis for relations between two countries that attach strategic importance to the ties between them. The Turkish side, too, apparently wants to move past the disagreement and restore relations with Israel. The words of Turkish Foreign Minister Ahmet Davutoglu testify to that. On the other hand, the harsh words being hurled in Turkey by his Israeli counterpart, Avigdor Lieberman, are hurting more than they are helping. Israel’s interest lies in restoring relations with Turkey, just as it does in renewing the Syrian track. If Turkey is the catalyst for that, we should avail ourselves of its good services. Ray Hanania, American-Palestinian, married to a Jew, running for PA presidency. PA negotiation officials for Gilad Shalit deal arrive in Syria to discuss finalizing deal. GLAD you find it reasonable. I do too. I’ve read a little bit about this fellow Ray Hanania, and he seems to be a fairly sharp person. His plan is fairly similar to what was proposed around Camp David 2000 with some interesting changes, like allowing Jews to live in Palestine, etc. The Israelis and Palestinians should get back to where they were 9 years ago. The Syrian and Palestinian tract are totally separated. Since the Palestinians aren’t arming the West Bank with missiles from Iran, so I guess negotiations with them may be easier. Moreover, Abbas has wisely denounced a continuation of “armed struggle” (aka “resistance”). I am GLAD the PA recognizes that although they don’t have everything they want, violence certainly isn’t going to improve anyone’s situation. without the Golan , any plan is a non starter , Syria will do anything it can to get her land back and rightfully so. I guess the Golan negotiations are in better shape now that Israel is mending its relationship with Turkey. I doubt the Israelis would humiliate Erdogan a second time. Israeli Minister of Industry, Trade and Labor, Benjamin Ben-Eliezer, is expected to propose to Turkey that it resume its mediation role in peace talks between Israel and Syria, in exchange for a return to more cordial relations between Israel and Turkey, according to sources in Tel Aviv, almanar.com.lb reported. The sources said that the policy was coordinated with Israeli Prime Minister Benjamin Netanyahu and the Foreign Ministry in advance of Ben-Eliezer’s departure on an official visit to Turkey Sunday evening. The sources say that Ben-Eliezer will stress that Israel will view Turkey as a mediator with Syria, but Turkey must first demonstrate a return to the normal relations that existed with Israel before a deterioration in ties at the beginning of the year in the wake of Operation Cast Lead in Gaza. The normalization will have to be shown through declarations and deeds, they say. Among such gestures, Ben-Eliezer will propose that Turkish President Abdullah Gul pay a visit to Israel and meet with President Shimon Peres. In the course of Ben-Eliezer’s visit, he will attempt to return economic, military, strategic and diplomatic ties to normal. The official reason for the minister’s visit is the annual Turkish-Israeli economic conference. In the course of his trip, Ben-Eliezer will meet with the Turkish agriculture minister as well as the defense minister, who heads the Turkish delegation to the conference. Efforts have recently been underway to arrange a meeting with a high-level Turkish political figure. In the absence of Prime Minister Recep Tayyip Erdogan, who is abroad, a possible meeting with President Gul or with Foreign Minister Ahmet Davutoglu is being explored. In the wake of Operation Cast Lead, Turkey found it difficult to restrain its criticism of Israel in the face of pro-Palestinian public opinion in Turkey. This was followed by public pressure, backed by Erdogan, to halt cooperation between Israeli and Turkish companies. In October Prime Minister Netanyahu rejected a Turkish proposal, conveyed through Spain, to resume mediation efforts with Syria. About a week later, Turkey canceled Israeli participation in air force exercises on its soil. The anti-Israel Turkish policies have been led by Prime Minister Erdogan, while President Gul is considered a pro-Israeli figure in the Turkish leadership. In reaction to recent declarations by Netanyahu regarding his readiness to negotiate with Syria without preconditions, Syrian President Bashar Assad’s senior political advisor, Bothaina Shaaban, said over the weekend that Syria’s position on opening negotiations with Israel is clear: Israel must first recognize Syria’s rights in the Golan Heights and present guarantees that it will withdraw. From Syria’s standpoint, she said, it is not a matter of preconditions but of rights that it cannot relinquish. At a lecture in Syria, Shaaban said the meeting between Assad and French President Nicolas Sarkozy about 10 days ago dealt with the peace process, the Iranian nuclear issue and Turkish relations with Syria. She said Syria is insisting that Turkey serve as mediator in any negotiations with Israel, and Turkey is an important country that had a central and rational role in the indirect negotiations with Israel. Negotiations under Turkish mediation, she said, proved to the world that Syria wants an agreement and Israel is hindering it. I’m not sure Turkey will quickly become broker again between Israel and Syria. Israel sees Erdogan has having gone out of his way to articulate his anti-Israeli messages and, to be honest, it is doubtful he or his government can serve as “honest broker”. It is a shame, because Turkey really can be the perfect 3rd party here, if Washington isn’t taking that role. I still fail to see why Syria is insisting on hearing those words (The Golan is yours) in public, before heading to direct negotiations. It makes it ever more difficult for Netanyahu to lay the groundwork for eventual withdrawal. Few today will support this announcement in advance, even though everyone knows this is the price for peace. 1_ about Turkey and Erdogan , I do not think that he said anything more than what you said at that time , you were one who felt terrible about what Israel did and called for the ending of the attack , at least that was what i understood , that you felt for the Palestinian people , was i wrong ?. You also should remember that Syria was burned by your leaders before , remember Rabin’s deposit only to see Netanyahu denying it and refusing to be bind with it , then came Barack who tried to cheat Syria and President Clinton when he gave him maps that do not include the shores of the sea of Galilee after he gave assurances that the maps will show the 1967 border , Syria kept it’s part of the bargain on the Golan without incidence for forty years , I think that Syria is more trust worthy than Israel and it’s leaders , Syria does not want to be fooled for the third time , you should not blame Syria or it’s leaders , they were fooled twice already . First, I’m not passing judgement over what Erdogan said. I’m merely stating that in the way that he said what he said, he will have great difficultly “convincing” Israel that he can serve as honest broker, that’s all. Of course I was against the attack as it was. I wasn’t against the idea of fighting Hamas as long as they kept shelling Israel. We have no choice but to continue to fight them until we make peace with them. I’m for talking to Hamas immediately, but if they shell Israel, we have to also fight them. But absolutely not the way we did in Gaza in 2008/9. Second, I’m not “blaming Syria or its leaders”. I’m suggesting that Netanyahu is the closest you’re going to get to an Israeli PM that can deliver the Golan and, therefore, you must try not to create conditions under which he is less likely to deliver – such as preconditions that make it extremely difficult for him to show up for negotiations. It’s exactly the same if Netanyahu would demand, in advance, to hear Bashar Assad announce that Syria will completely alter its relationship with Iran, Hezbollah, and Hamas. Bashar cannot do that, even if there’s every likelihood that something along those lines will happen after Israel withdraws from the Golan. Lastly, I think trying to get Netanyahu to announce Israel’s readiness to give back the Golan, in advance prior to negotiations, simply based on previous “deposits” or agreements or promises, is overly simplistic and unrealistic. Much in the political climate of our region has changed over the past decade (since Bibi was in power), and you cannot expect Bibi to be able to say and do the same things today as he did back then. Today, Israel is far more to the Right than it has ever been. To remind you, in Rabin’s days, Labor had 40 seats, out of 120 in Knesset. Today, Labor has 13! Meretz has 3. “The Left” in Israel is 16 seats out of 120. And the “leader of the Left” (Barak), okays further building in West Bank settlements. So Bibi cannot say certain things right now, that maybe he could have back in 1998. We must come to realize that now it is all about psychology of the masses, not about mastering diplomacy. Assad must give Netanyahu the “tools” he needs to convince his hawkish masses that Syria is serious about Peace. And Netanyahu must find the way to give Assad the “tools” he needs to move forward with direct negotiations. Syria would be wise to find a way to speak to the Israeli people, and in so doing help Netanyahu market the Golan soon afterwards. But not before negotiations take place. Look at what’s happening now, with his announcement about freezing settlement activity (in most of the WB, but not all). They’re starting to crucify him on the Right, including within his own party. An extremist member of Likud yesterday called out to “throw Bibi to the trash of History…” Imagine what they would do, if he suddenly announced Israel was ready to give back the Golan. His government may collapse in an instant, bringing about new elections. And who’ll win this time around? Kadima? That Tzipi Livni who couldn’t be Prime Minister, when offered to her twice? First time on a silver platter, without even going to elections. And second time, to share the PM’ship with Bibi. She’ll make peace with Syria, when she can’t even reach an agreement with Shas (the religious party)? Barak? The recent poll shows him getting Labor 6 seats out of 120! 13 isn’t low enough for him. So the bottom line is – if there is a chance for peace now, it’s only with Netanyahu. Syria should understand that Netanyahu needs her help. It’s that simple. What a great way to show that Israel wants peace!! What Israelis wants is to stop the US and Europe to pressure them. They are giving in symbolic stuff that they know are unacceptable by the Palestinians just to please their masters and have Obama take his Nobel award with some meat to show, they are cheap and pathetic. Shai, if this is a democracy with inept and weak leaders who manipulate the masses and lick the feet of the international leaders to stay in power, frankly i prefer a dictatorship with intelligent leaders and at least some pride. In a recent poll about corruption, the two most corrupt politicians were Avigdor Lieberman, and Eli Yishai (Shas). So don’t think Lieberman is viewed as any real authority in Israel. He is under multiple investigations, there is a good chance he’ll soon make his declarations behind bars, and that his party will soon thereafter evaporate. I’m not claiming he’s meaningless, but give it a few more months. The Police is super-determined to see him in jail. That’s at least one powerful aspect of our democracy. during the civil rights movement Martin Luther King got the civil rights act first then when he asked President Johnson for the voting act , Johnson told , i can ask Congress for more now , we just passed the civil rights act , If you want it you have to make me and show the congress , the next day there were demonstration in many big American cities for the voting act which made it easier for president Johnson to ask Congress for the voting act to avoid a civil war . Political , economic , Legal or military pressure is needed for any Israeli leader to justify peace seeking . I agree with you that Israelis are happy with the statu quo. They are not receiving rockets from Gaza, and the Lebanese and Syrian front are quiet. Israelis are enjoying skiing and drinking wine on the Golan, settlers are happy occupying Palestinians homes with the muteness of the international community, why in the hell they would want a peace treaty with all the unknown and the ‘sacrifices’ they will have to do? The only pain in the neck is the Obama administration, the trouble maker who is influencing Europe to take an unusual stronger stance against Israel. The strategy of Israel is now to neutralize this “idealistic parasite” while making apparent ‘sacrifices’ that are well covered by the media to show how Israel is cooperating in an ‘operation charm’ with the international community, especially after the embarrassing Goldstone report. I am sure the Jewish lobbies are using all their energies to make sure Obama and the democrats will not be elected for a second mandate. They may go to dangerous extremes. I worry for Obama’s life. If I don’t advocate military force against Israel, I advocate more precise threats on Israel. Iran remains the strongest military threat and, using existing internal dissensions, it is been quietly demonized by the media in the hope that its regime will fall. I am not surprised Khamenei is accusing the international community , using Israel sympathizers, to plot a replacement of this regime by one who would be less threatening to Israel. The accession to nuclear weapon capability by Iran would be the trigger to have Israelis worry seriously about happily continuing their aggressive policies. I just hope Iran will reach that stage soon. I just don’t see anything significant happening before that event. By the way, the Lebanese ministry declaration imbeds a statement refusing settling permanently the Palestinians in Lebanon. I understand the frustration you feel as you look at us Israelis, living in a so-called Democracy, able to vote in and vote out any leader we want, and yet we enable inept politicians to continue to rule over another people and their land, while we claim we’re a peace-seeking and loving nation. I feel the same frustration, but from the other side. And like you, I too ask myself endlessly what must happen to change this situation. Must we have another 1973? Are we really that intoxicated with our power, that we’re right back in those terrible years between 1967-1973, when we thought we were invincible? Must we continue to push every Arab nation (and especially the Palestinian people, Syria, and Lebanon) to the corner, to the point where only another regional war could be the way out? Like you, with each day that passes I’m tempted to say “yes”. But unlike you, I still have faith in my people. Wars have always had a similar affect on Israelis – they’re united us like never before. If right now there are probably 70% of Israelis against returning the Golan, if Syria were to attack tomorrow morning, there would be 95% against it. It would take a number of years, maybe more, before we’d start changing our mind. There is no guarantee that Bashar would do what Sadat did in 1977. What if 1973 occurs again, but 1977 doesn’t? We know how wars begin, but we don’t know how they end. And the next war in our region could be catastrophic. Are we ready to take that risk? I’m not. Not as long as I know we haven’t tried everything. And because I know that Syria can be infinitely stronger if it targeted Israelis directly with PR and not with rockets, I can’t say everything has been tried. You are looking at the glass only through your end, not through ours. You see your frustration with Israel, but not Israel’s fears and suspicion of the Arab world. You deduce that Israel cannot fear the Arabs, because if it did, the reasonable thing to do would be to make peace (I agree – that would be the logical thing to do), but people and nations don’t always act rationally. Further, we may indeed fear you, and at the same time know that we are stronger. We know your old Mig-29s are no match for our F-15i’s, but we still fear Syria’s intentions (certainly when we hear of a possible nuclear installation somewhere in the Eastern Desert). And because there exists no trust between Syria and Israel, most Israelis suspect you, and are afraid to give back something which they consider strategic, and believe can further endanger them if used by Syria against Israel. If you want us to understand you, your concerns, and more importantly your legitimate rights, you need to be ready to understand ours. You don’t have to agree with them, but you should listen and if possible address them. And that’s they key, I believe. If you can address our fears, directly not through some BBC interview, or Turkish newspaper, then I’m sure you can begin to create trust amongst Israelis. We had that trust only 14 years ago, during Rabin’s days. I believe we can achieve it again, and even surpass it, if Syria speaks to us directly. This is the only thing you haven’t tried, short of all-out war. Don’t you think it’s worth trying, before you choose the horrific way out? I can understand the anxiety of the Israelis because all they see about the Arabs are the threats from spoliated people asking for justice and revenge and from extremists as noisy as yours. They are also encouraged to transpose the past fear toward their European persecutors onto the Arabs. When I read AP, I realize that many Israelis have totally evacuated from their mind the slightest idea that wrong and injustice was done to the Palestinians when Jews took their lands by force to create Israel. Can you explain to me why Israel who was compensated largely by the European countries who spoliated them, NEVER offered to compensate the Palestinians for the lands they confiscated and the harm they have done to families? It is as they feel it is not their problem, and hell with the people they kicked out! Let someone else take care of them! I feel as if the Israelis are brainwashed not to feel any guilt, am I wrong? They seem also kept in a deep parananioia of denial, fear and suspicion. This is deeply engrained and cannot change just by arabs showing understanding. Understandng for what anyway? Arabs did not massacre Jews, Europeans did it. You are asking the Arabs to feel for the Jews who suffered the holocaust while whole Palestinians families were reduced to refugees and live in insecure conditions. Sorry, Shai, it is to the Israelis to show understanding, but obviously stuck in their own fears, selfishness and brainwhashed from youth, they can’t. Contrary to Egypt’s peace negotiations where issues were mostly of lands and security arrangements, with Syria and Lebanon there are millions of Palestinians whose destiny is at stake. There was also no issues like Jerusalem’s status. These are much more sensitive issue both for Arabs and Israelis. I don’t think Bashar will make any move, unless he perceives a real willingness to tackle issues not of land only but of people. Unless Israel shows a sign that it accepts its guilt and responsibility for the state of these refugees, there is not much that can be done. Do you think that Israelis could revisit their attitude if they feel they may loose the US and the international community support or like Iran, it may make them more defiant? “They seem also kept in a deep parananioia of denial, fear and suspicion.” Yes, unfortunately this is true. This is perhaps the biggest hurdle ahead of most Israelis. The “understanding” I was talking about referred to empathy, not necessarily sympathy. I don’t expect you to sympathize with my family’s loss during the Holocaust. I do hope you’ll understand why Israelis suspect Syria. Syria didn’t massacre millions of Jews, true, but it did launch two wars against Israel, the first out of rejection of the UN Partition Plan, and the second out of attempt to retrieve the Golan. In both cases, Israel felt its existence was at stake. When Israelis see Syria embracing an Iranian regime that is calling for Israel’s annihilation (I don’t want to get into whether it’s “Israel the nation” or the “Zionist Entity”), or arming our enemies with offensive capabilities, or allegedly developing a nuclear program, our fears and suspicions grow. As for the Syria-Israel peace negotiations, I seriously doubt they ever included Jerusalem. I’m sure Right-of-Return was discussed, and if I’m not mistaken, Syria did offer to naturalize her Palestinian refugees (after they receive compensation, etc.) Obviously, this is not the case with Lebanon. My guess is that when Bashar spoke of the “20% left (to close the deal)”, he was referring to Land issues more so than the people ones. I imagine Israel and Syria have pretty much agreed that the Comprehensive peace agreement we were all hoping to achieve would not be a prerequisite to peace between us. If Israelis felt suddenly that they were “losing the U.S.”, there’s a good chance many would try to understand why, and not only in private, but also through public discourse. But I doubt we’re anywhere near that day. Obama seems to want to always satisfy everyone. I can’t understand how he plans to bring peace to the Middle East at the rate he’s moving. Thanks for the reply. I do feel sorry for all the pain and traumas the Holocaust has caused the Jewish people and your family. I saw a documentary on Norman Finkelstein. His mother who was a holocaust survivor until her death was still trying to make sense of what hapenned to her. Having lived the persecution, humiliation and the sense of powerlessness is a terrifying and traumatic experience that lingers for generations and very difficult to heal. I am not surprised by the psychological state of mind in Israel. Yet, while the cult of power and the use of violence has allowed the Jews to try to live a normal life in Israel, it seems to have become a second nature and maybe it is very hard for Israelis to feel compassion and show generosity for fear of appearing weak. Bullying seems to be the normal way of dealing with people. I do not know if this aggressivity is visible in everyday life among the Israelis but I won’t be surprised if it is. Simple gestures of compassion and humanity from Israel may open many doors to the heart of the arabs. Bullying and threatening with an attitude of superiority is bound to close these doors. I agree that Obama appears lost but I think it needs time to figure out a way in the labyrinths of the ME. I give him the benefit of doubt and wait. You are so right, and it is so basic. It is a universal truth, applicable everywhere, to all people. But the problem seems to be, that my people truly don’t feel they’ve victimized anyone – they feel the victim. Though I’m no psychologist, I claim that we really haven’t dissociated ourselves yet from the horrific results the Holocaust had on our grandparents, and as a result on their children, who are our parents. My generation is the first one in our history that really had a chance to grow up without seeing the results of the Holocaust first-hand. My parents grew up in a home that had Holocaust survivors – people that saw, experienced, lived through, and miraculously survived one of the most horrific episodes in human history. All of their brothers and sisters, parents, uncles, aunts, everyone were sent to concentration camps, and left them through gas chamgers and chimneys. Imagine (my parents) growing up with parents who survived this hell. Thankfully, I grew up differently. I also spent a good part of my life abroad. I have a very different perspective from most Israelis. I know what Arabs are really like, not only the ones that are shown on our TV sets in Israel, or that play certain roles in our books as we grow up. Arabs had a very different part in our national ethos, than the one I saw whilst abroad. It is truly a catastrophe, that a people that were a victim of one of the worst crimes in history, would soon afterwards use their newly acquired power to rule over and victimize another people, who have no less basic human rights than any of us did, or do. But most Israelis still do not understand this. As I’ve said to Akbar a few times before, when we are in the 7-day period of mourning after a person has passed away (we call it the “Shiv’a”), Jewish tradition has us cover up all mirrors in the house – so that we would not be tempted to think about ourselves during this period. I said to Akbar, that after 62 years, it is time we took off the covers. It is time we looked ourselves in the mirror. But WD, though we are the stronger nation in the region, we are still very weak in many ways. I doubt we will be the first to exhibit emotional courage, and to apologize to the Palestinians for what we’ve done. Sadat must have realized this, when he decided not to wait for the Israelis to wake up, and got on a plane and came to Jerusalem. While I understand that Bashar doesn’t want to seem like another Sadat, and that indeed the situation is different today, I do think Syria is far stronger than it thinks, and should find a way to “help us help ourselves”. It should talk to us, the Israeli people. It should allay our fears, or at least spell out its own hopes for a peaceful future. The direct-contact is what’s terribly missing in our conflict. We’ve only met on battlefields, and on TV-screens where reporters and politicians delivered their interest-driven information to us. How can either one of us allay our fears, remove the distrust and suspicion, even just long enough to negotiate a peace treaty? No human is born a bully. And few bullies really want to be bullies. It is the psychology of nations and their histories that is at play here, not some innate character that cannot be treated or changed. Recognize the bully’s fears (rational or irrational as they may be), address the bully’s fears, and see the bully become a non-bully. I know Israelis, WD, and I know that while we do fear for our Jewish existence, we don’t want to rob another people of their freedom. We do understand what it is like to be persecuted. Give us hope and tell us that we mustn’t fear you, and we will let down our emotional and physical barriers. We will reciprocate. I am confident of it. Your reply brought tears in my eyes. Your analysis is so true. I do feel more than sympathy for Israelis when I see movies about their lives, their anxieties and talk to some on individual basis but I feel frustration and rejection when I see what their governemnt is doing, hear their politicians or read these american-jewish neo-con journalists defending blindly Israel’s actions. Maybe Israeli artists are the only effective ambassadors, and should move on the scene, instead of staying in the background. I guess we are both emotional and are inherently compassionate, it is a matter on meeting half way and this seems to be the hardest thing to do, both sides have resentments, grievances, psychological hang ups. How to break that, I don’t know, but I think letting the common israeli realize that arabs are not inherently hateful people and that gaining their hearts is what counts and it is not as difficult as it appears. I hope it happens, Shai, for the good of our generation and the next one. Indeed we are both an emotional and inherently compassionate people. We are much closer to one another, than to so-called “Westerners”. Anyone who knows both Israelis and Arabs knows this to be true. I don’t think we need to truly meet halfway. I think we just need to meet, to get close enough to begin to empathize. To begin to see how different we are, from what we’ve always been taught to believe. How this “brainwashing” has caused us to do things against all rational thinking. How our own, often irrational or exaggerated fears and suspicion led to hatred, and robbed us of peace for decades. I really do hope Syria can find a way to talk to Israelis, directly. If tomorrow evening Bashar Assad is interviewed on Israeli television, by 3 Israeli journalists, all sitting at the Presidential Palace in Damascus(! ), this will be the kind of “shock therapy” that we need. And I promise you, it will have a tremendous effect within Israel. I really hope we can see this day soon. Because if it’s not that, then Syria and Israel will both be gambling on Netanyahu’s real plans. Is he interested in simply holding on to the throne for another few years, and going down in history as another Shamir, or is he planning to be the one to end the Israeli-Arab conflict. Are we ready to gamble on the latter, or are there other things we can do as well?